Faith So Simple, As a Mustard Seed... So Why Does Religion Complicate Faith? Faith is so simple. So very, very simple. It is religion that complicates it. Control, perhaps. Distinction from other religions, maybe. I'm not quite sure. What I do know is that faith is not about either control or distinction. Instead, it is about release, the turning loose of all attachments. When Jesus said, "If you have faith no bigger than a mustard seed..." (Lk 17:6) he was not saying faith comes in varying quantities, as in 16 oz. sized faith, or 32 oz. or super-sized. Yet, this is how so many religious people have mistakenly understood his words. It is a mistake easily made. I have a friend, for example, who joined the ranks of the "nones" some years ago, even before the press began designating this rapidly-growing segment of our American population -- the formerly religious who've given up on organized church or religion. Like many of us, he was raised in a fundamentalist Christian church where they believed in degrees, or sizes, of faith. To be sure, faith the size of a mustard seed was better than no faith at all. And, they reasoned, according to Jesus, even this size faith could accomplish much. The really faithful Christians, however, or believers, were those who possessed a bigger faith than this. As a consequence, they were also the more favored by God and, without question, more spiritual than others, too. Which is why, when his mother was diagnosed with cancer, the members of his fundamentalist church gathered around her and prayed for her healing. They had big faith. They were certain, if they prayed, believing the cancer will be removed, it would be removed. She would get better. So, they prayed. They believed. So, they prayed more and harder. They pleaded God for bigger faith. They believed that some among them may not have had faith even the size of a mustard seed, otherwise her healing would have come sooner. Some pointed fingers. Others continued to pray. All of them kept pleading for God to grant them more faith... greater faith... faith enough to be big enough to result in her healing. On the night before she died, my friend described the scene this way: "It was as if the whole church family was gathered outside her hospital room in prayer. Some on their knees. Others with raised hands. Everyone was wailing and believing and seeking to turn their mustard seed-sized faith into something bigger... something more deserving of God's attention... something that would finally get results and heal Mom of her cancer." "We've got to have more faith!" our fundamentalist preacher insisted. "Everyone should join hands together," he directed, "and let's pray for more faith... let's pray her through to healing!" She died, however, at 8:00 a.m. the following morning. He quit going to church altogether after that fundamentalist fiasco. And, only recently, has he begun talking about God at all. For many years, he just lived with his resentment toward the whole matter, offended by the church minister and church family who regarded him as the culprit... the one not having enough faith or adequate faith to be deserving of God's compassion and healing for his mother. It is understandable why he has lived with much guilt over this regrettable experience. In time, however, he realized the futility in their thinking... in their believing. His guilt turned him against this church, and every other church, too. I doubt he'll ever return. Why? Not because he's quit believing in God. He hasn't. He, like so many, has been hurt by beliefs that are just plain wrong. In this instance, he was misled to believe that, had he had enough faith, she would have been healed. When she died instead, he was left with no other conclusion but that his mother's death was his fault, the consequence of his too little faith. This is such a perversion of what Jesus was actually saying through this beautiful mustard seed metaphor of faith. So, what was Jesus really saying? The capacity to believe -- or, a better word here is "trust" -- the capacity to trust is a Divinely-endowed capacity. I suspect, as do many others, this capacity is written into the genetic code of your DNA. As that capacity is reinforced by caregivers and others, it naturally grows... it expands, just as the mustard seed germinates and grows into a Mulberry tree. Infants and children who come into this world, for example, come endowed with this believing capacity in tact. Which is why they are not only totally dependent but completely trusting. Undermine that trust, however, and this natural capacity to believe -- to trust -- is weakened, harmed, or hindered. In some cases, the damage can be so severe, it may take nearly a lifetime to restore. Do you see how, for example, the reported incidents of clergy sexual abuse of children can undermine and perhaps even destroy the natural capacity to believe in these who are now adults? The incidents of abuse must number in the thousands -- maybe even the millions -- and is so unimaginable that you can understand why Jesus would say, "If anyone causes one of these little ones -- those who believe in me -- to stumble, it would be better for them to have a large millstone hung around their neck and to be drowned in the depths of the sea" (Matt. 18:6). What do you do, then, if your natural, God-given capacity to trust -- to believe -- has been undermined? Damaged? Even if you have not been sexually abused by a priest, pastor, or parent or caregiver, you've grown up in a family environment where love has been conditional; or, a religious environment where the things you've been taught to believe are just not so, as in the situation with my friend. What should you do? 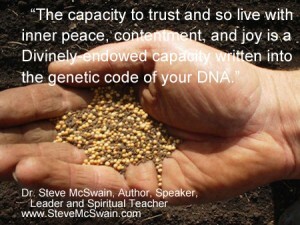 Can you nurture faith... or the capacity to trust again? If you're finding it difficult to live in trust -- to live by faith -- it is little wonder that life for you is filled with fear, anxiety, and very little inner peace and happiness. These are the natural consequences of living under the illusion of control -- and control is an illusion -- instead of living free...instead of living from a place of trust. To live by faith is simple, thought it will take a lifetime to master: it is simply releasing the illusion of your control and the inner permission to allow life to unfold naturally... as of course it will. So, here's what I would suggest. 1. When you feel insecure, suspicious, fearful, or out of control, practice releasing the control of your life to Life itself. See if you can trust, even if that trust lasts but a few seconds, when Jesus says, "Seek first the Kingdom... all these other things will be provided" (Matt 6:33), he means what he says and you need not be overcome with worry about life. Again, even if you are only able to sustain this release unto God's care for a few seconds or minutes, live into that release and feel the joy that comes from it. In the beginning, it will likely be but seconds or minutes before the fear or worry returns. With the return of anxiety, the illusory belief you can control things kicks in, too. Controlling life is an illusion. Yes, of course, you can control a few things -- such as, what time you get up, whether you are going to hustle to find a job, what you're going to eat for lunch, how you're going to react in a certain situation, or the choices you will make in life. But, there's much about life you cannot control. Trust is that God-given capacity to step outside the illusion of control and, as a consequence, live peaceably in the ambiguity and awkwardness of uncertainty-the uncertainty that is your life and mine. Practice releasing control and so trust that all will be OK.
For, it really will be OK.
2. Next, you must make this activity of releasing control to the Unseen a regular spiritual practice. Which is partly why I write as I do about the spiritual path. I write for others to read and so learn. But I also write to help myself. I need help. The discipline of writing about the spiritual path keeps me between the lines, so to speak. Life is filled with perils. Those who practice the spiritual disciplines that Jesus taught, or the Buddha, or Lao-Tzu or Confucius or any one of scores of other spiritual masters throughout history, discover that their capacity to trust, though small at first like a mustard seed and temporary, soon grows into the size or capacity of a Mulberry Tree. This is the process Christians call growth in Christ, or "salvation," what Saint Paul called "working out your own salvation" (Phil. 2:12). It is what the Buddha referred to as the pathway to "enlightenment." Stay on your path. 3. But do not be hard on yourself when you stumble. For, you will stumble and fall. Let's suppose, for example, you are meditating or, as Christians sometimes call it, praying, and you feel the joy of releasing all illusions of control. As you do, the anxiety... the worry disappear and, in their place, joy and peace fills your inner soul. You feel free. Soon, however, the thoughts return. You slip or stumble. You start thinking again about all the things you must do to make your life more secure. The conversation in your head takes over, incessantly commenting to itself on the conditions of your life and what might happen if you don't take immediate actions to correct things yourself. With this mental noise-making and scheming on how to be in more control, fear and anxiety stealthily return. And, with their return, the feeling that you're a spiritual failure, too. Well, my advice is that you STOP feeling like a failure. You're not. We all stumble. Be done with judging yourself. Instead, recognize that you have succumbed, as we all do, to the little ego in yourself -- the one who loves to Edge God Out, so to speak -- and, so, sit in the driver's seat of your soul, pretending to be in control of all the circumstances and conditions of your life. It is not in control, however, my friend, and your awareness of the return of the ego is all it takes to remove it to the backseat once again and return God to the driver's seat. In other words, awareness of your stumble is all it takes to automatically restore you to the spiritual path. No need for forgiveness. What is their to forgive? If anything, it is a cause for celebration. That's all it takes to grow. The challenge is to make this your spiritual practice. Like the beautiful tree my wife and I planted in our front yard just three years ago, you will rise some morning, as I did this morning, look out the front window and marvel at how much the Mustard seed of faith has grown in you... or, how much your capacity to trust and believe again looks very much like a Mulberry Tree.